As a computer science and online learning coordinator, I'm always on the lookout for great teaching resources and project ideas. If you're like me & love to shake things up with new & exciting projects and like to keep on top of the latest and greatest educational technology trends, check out this blog! For as long as I can remember, I've kept track of things I need to do with paper lists or sticky notes. Although this suited me fine for many years, when I started working as a Tech Trainer and now an Instructional Tech Coordinator, I found my system to be inadequate, to put it kindly. 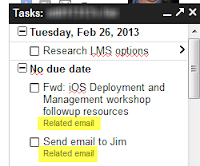 I then discovered the Tasks feature in Google. Tasks lets you create a simple to-do list that's easily accessible through your Gmail and can therefore be added to and accessed from anywhere. You can also set due dates on tasks, which will then put them on your Google Calendar, which is great! Even better, you can create a task from your email which will add a link in the task that takes you straight to that email so you can find it easily again later. That worked much better for me, but I found I was still forgetting to do things and having trouble staying on top of what had to be done for a particular project vs. another. Enter GQueues! I searched high and low for a solution that would allow me to organize my tasks into separate project lists, integrate with Google the way their Tasks do, and still be easy to use. Oh yes, and affordable please! After almost giving up hope, I foung GQueues. GQueues not only integrates beautifully with my Gmail and Google Calendar, it lets me easily organize my tasks within projects, create subtasks, schedule recurring tasks, and tag tasks to keep me even more organized than I thought possible. It also has a fantastic collaboration feature that allows you to share projects and their tasks with others as well as assign tasks to other people. It has a ton of features; I could go on and on. What's great though, is that it's EASY TO USE! I don't have to deal with Gantt charts or other task management features that other solutions offer which are way beyond the scope of what I need. Within a week of using it, I had my entire team signed up. Less than a month later, another department that had heard one of us rave about it approached me, signed up, and started using it too! I created a short, one hour training for folks who are not at all tech savvy in an effort to help get them started. After that hour, they were off and running. Honestly, if they had played with it for 20 minutes, I think they would have figured out the basics on their own. Best of all, many of the basic features are free to use. For the full set of features, it's just $25/year (less with a domain subscription). You can check out all the price details on their site. 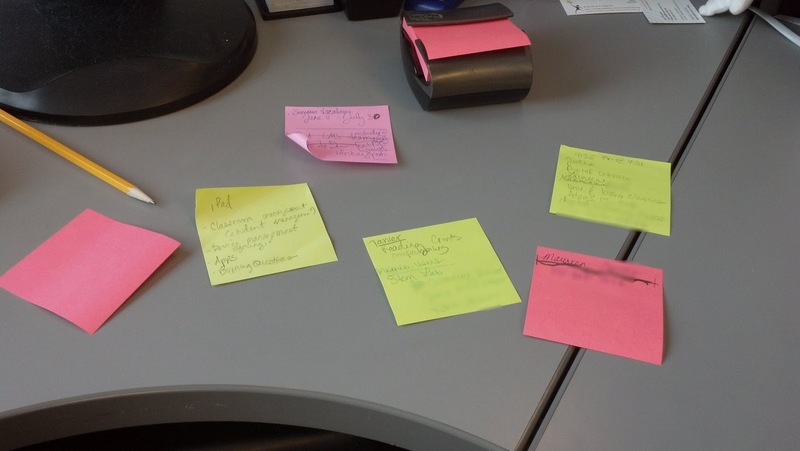 Although I'm still guilty of using Post-its now and then, I have not dropped the ball on a single task since starting to use GQueues. As a side benefit, I'm now a lot less stressed out. I hadn't realized how much anxiety it caused me to try to stay on top of everything without a good system! If you've been looking for a great task management solution, you really should check out GQueues. If you've got another system that you love, leave a comment below and tell us about it! Great post! I've been using GQueues for a couple years and it's an essential part of my everyday toolkit. I appreciate you sharing your training doc as well. I work at an ESA so I'm looking forward to following your future posts. Great post. Love GQueues. Has Cameron seen this? I've been using Evernote to keep up with my to-do lists. I love that I have access to all my notes on whatever device I have with me at the time. GQueues sounds interesting because of all of the integration with Google, and it's cheaper than the $45 per year that Evernote requires for you to be able to share editable notebooks. Thanks for the suggestion! As the school year ramps up, our department has been busy creating a training module on COPPA and protecting students online. This is a module that all teachers in our District will be taking this year (and likely every year going forward), thus denoting a significant shift in our District's messaging about tech integration and student safety. Each Friday, I spend time at the media center of a local high school making myself available to teachers who may need tech help. About a month ago, I was speaking with the school’s librarian and learned that their media center only has one set of encyclopedias available to students. She explained that over the last few years, more and more students have been turning to the Internet for their research needs; very few use the library as a resource for this purpose. As a “techie,” this was no surprise to me, however, I can’t help but wonder how many teachers take the time to help their students learn how to identify a credible Internet source vs. a biased or hoax site. This week has been a tough week for me. 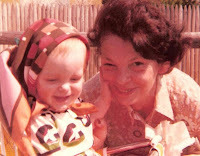 My grandmother, who I'm extremely close to, passed away on Wednesday. Her health had been declining for quite some time, however, after having a wonderful visit with her on Saturday, I never expected that the next day she would slip into unconsciousness and remain that way until finally passing away on Wednesday. I learned of her condition after school on Monday and immediately rushed over to her nursing home to be with her. I took the rest of the week off to keep her company and then to be with my family after she passed. I've been teaching since 2000. I've taught 4th & 5th grade general ed. as well as middle school computer classes and applied tech. I've worked as a technology trainer, instructional technology coordinator, and am currently a computer science and online learning coordinator.